This section is intended to document all those gigs performed by the Rock and Pop Masters project which featured Joe Bouchard as a guest musician. 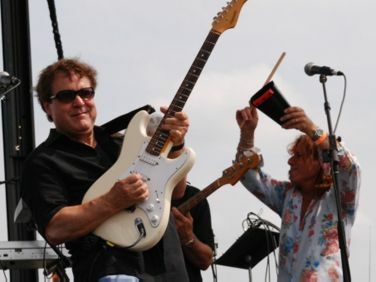 Rock and Pop Masters feature a core band of musicians based around the Orleans band featuring the three Hoppen brothers, Larry on guitar and keys, Lance on bass, vocals and percussion, and brother Lane on keys and vocals. Augmenting these are a rotating number of guest musicians who come bearing hits, one of whom is Joe Bouchard and generally his section of the show will feature just three songs: Burnin for You, Godzilla and Don't Fear The Reaper - though he does occasionally fill in for other missing musicians - as well as joining in with the final all-star jam at the end. The Joe Bouchard / Rock and Pop Masters giglist is here, the known setlists here and reviews here. If you can add any information to any of these pages, please let me know. Anyway, if you've ever ever seen a "Rock and Pop Masters" gig with Joe Bouchard appearing, please send me a . Probably Joe's most ambitious undertaking - and certainly the most dangerous and exciting - was the 5 gig Rock and Pop Masters tour of Iraq and Kuwait in early July 2010 to entertain the US troops. "We had a great tour. It was exotic, exciting, dangerous, very heart warming and more. As we got closer to the tour start, I kept thinking to myself, isn't there an age cut off for this kind of thing? But if Bob Hope can do this into his 80s, well... Where's my golf clubs? People keep coming up to me an asking what it was like. It defies description because it wasn't just your ordinary tour. God bless our troops. You can't imagine how rough it is out there. It is something I'll be telling to my grandchildren about not too many years from now." Check out the youTube clip above and read more about the trip in the reviews section.